I know that every picture should contain some sort of information = EXIF, what interests me is datetime, as I have now 20 000 pictures on disk unsorted, recovered from lost partition. 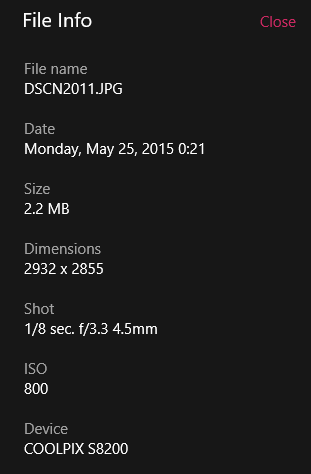 I wish there was a way to sort those photos by timestamp, is there? If so, what software could I use? The timestamp should be extracted from the EXIF information. So far I use integrated Windows 10 tools to image view, edit and so on. No third-party application. I am looking for an application of such capability. The lost partition was of type NTFS, MBR, so no backup table. The drive is a SATA HDD. I have already recovered all the data, but the question is different: How to name the files by EXIF information. Despite I work on both Windows and Linux, I wish this work to be done on Windows, filesystem on the drive was NTFS. The markers you need to use are %Y, %m and %d. You can add hyphens or dots in between them as you wish. You could use Bulk Rename Utility. It is a freeware, GUI tool for Windows. It can rename files in a variety of ways. To rename based on the EXIF date/time, look at the option for Auto Date (8). If you set this to Taken (Original) it will use the EXIF tags. You can specify how the date/time should be formatted, and what separators between segments. Those are the command you will need according to your question, but the mentioned tools can do a lot more – e.g. rotating the images, adding comments, and the like. I use them a lot for batch processing of my photos. "C:\Program Files\Java\jre1.8.0_144\bin\javaw.exe" -Xmx256m -jar "C:\Program Files\AmoK Exif Sorter\exifsorter.jar"
It works just fine for my case. Not the answer you're looking for? Browse other questions tagged windows data-recovery exif or ask your own question. How can I rename photos using EXIF data? Tool to recover lost folder hierarchy and file names?